"Brussels Sprouts are shredded like cabbage and quickly sauteed in bacon drippings with garlic and almonds. This recipe has made Brussels sprouts lovers out of haters." Fry bacon in a large deep skillet over medium heat until browned and crisp, 5 to 10 minutes. Remove bacon with a slotted spoon and set aside on paper towels. Add the garlic and almonds to the fat in the skillet and cook briefly over medium heat until toasted. Add the Brussels sprouts and quickly toss to coat with the hot oil. Sprinkle the red wine vinegar over the sprouts and toss again to coat. Cook, stirring frequently, until sprouts are wilted. Remove from the heat, stir in the bacon and season to taste with salt and pepper. Perfect as it is. 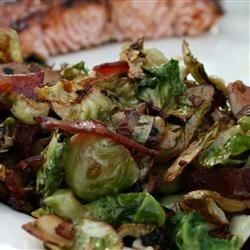 Hubby HATES brussell sprouts but devoured this when I made it to go along with pork chops, and even asked for seconds!